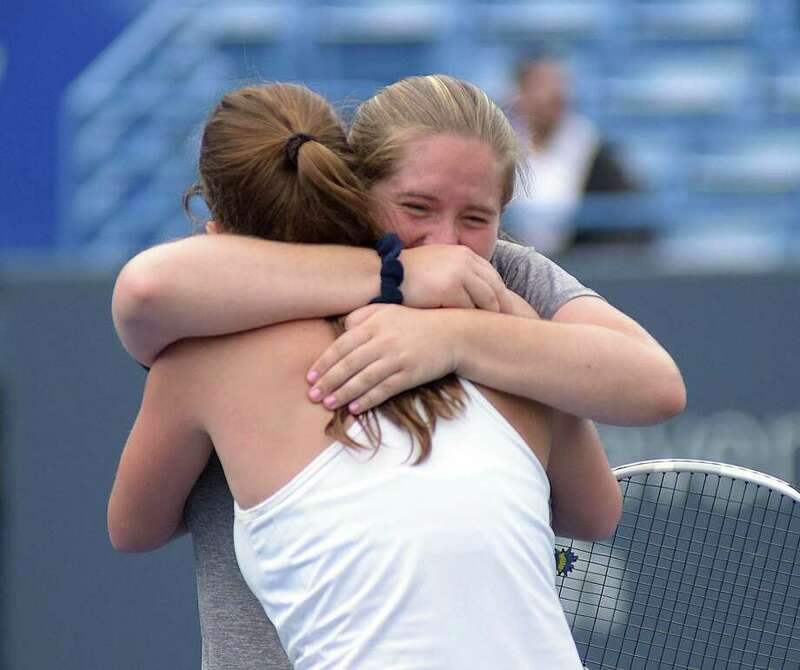 The Staples High School and Stamford High School girls doubles finalists did not disappoint the crowd that ventured to the Connecticut Tennis Center Stadium Court Wednesday for the State Open Championship final. In a third set for the ages, Staples seniors Kristin Butler and Hannah Bjorkman fought off Stamford sophomores Devon and Taylor Yaghmaie, 6-4, 0-6, 7-6 (10-8 tiebreaker) to take home gold in doubles. There was exceptional tennis on display in the singles final as Stonington High junior Gabriella Dellacono downed Staples’ senior Alyssa DiMaio, 6-1, 6-1. Devon and Taylor Yaghmaie won the State Open doubles titles as freshmen in 2017. As No. 2 seeds, the twins beat Staples’ Butler and Megan Brown, 6-0, 7-6 for the title. They returned to Wednesday’s final as the No. 1 seeds and having lost just six games on their journey to repeat as champs. Staples’ Bjorkman and Butler raced to a 5-1 edge in the first set despite the presence of a vast contingent of Stamford High students. The Yaghmaie sisters closed to 5-4 with two service breaks. But Staples’ seniors broke back to take the early edge, 6-4. In the second set, Stamford rolled to a 6-0 triumph to even the match. The deciding third set saw Stamford lead 3-1 and 5-3. However, Staples forged ties of 5-5 and 6-6 to force a tiebreaker. Not surprising because the duos had fought through three sets in their regular season matchup as well. Wednesday’s tiebreaker saw Staples lead 4-2 and 6-3 before Stamford fought to ties of 6-6 and 7-7. At 8-8, Staples finally scored the successive points to end the drama at 10-8. Their post-match pain was obvious. But the Yaghmaie sisters have two more years to battle for State Open doubles gold. Wednesday’s State Open singles gold medal was a just reward for Stonington’s Dellacono. She closed out the season at 27-0 and she is 75-4 thus far in 2018. Dellacono lost in the 2017 State Open singles final to Glastonbury’s Alex DeNucci, now playing tennis at Villanova University. It was a memorable State Open for No. 6 seed Alyssa DiMaio of Staples. She ousted the No. 2 and No. 3 seeds to reach the final. GIRLS DOUBLES FINAL: Kristin Butler/Hannah Bjorkman (Staples) def. Devon Yaghmaie/Taylor Yaghmaie (Stamford), 6-4, 0-6, 7-6 (10-8). GIRLS SINGLES FINAL: Gabriella Dellacono (Stonington) def. Alyssa DiMaio (Staples), 6-1, 6-1.